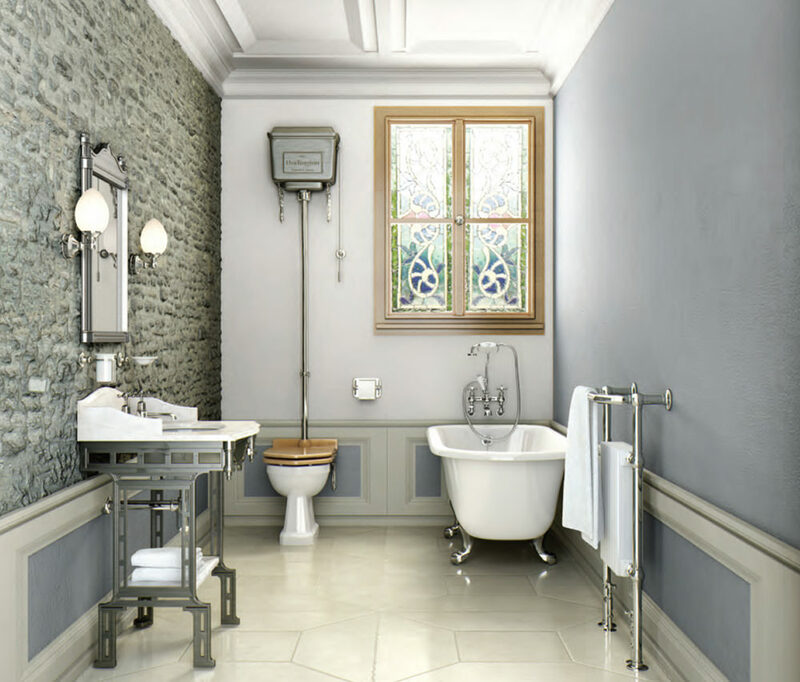 Gift your bathroom stylishly majestic appeal by adorning it with this regal Bathroom Suite from the aristocratic Georgian range of Burlington. This suite includes a marble slab with basin and polished aluminium basin stand, freestanding bath with classical legs, high-level WC and aluminium cistern. The marble slab is treated with Spray-N-Seal which protects the surface from staining. The bath is produced from high quality Lucite acrylic. The manufacturer backs this unit with ten years guarantee against any manufacturing defects on this suite. Incorporates standard cradle, 'S' adjuster, Claremont, Anglesey & Birkenhead divertor handle, hose, ceramic telephone handset. Suitable for wall mounting installation. Image shown is for illustration purpose only. Burlington Georgian Mirror comes with polished aluminium frame. Mirrors are sealed with Gunther Seal - Kwik. High quality chrome plated radiator designed to be plumbed into your central heating system. Image shown is for illustration purpose only. Chrome finish Claremont Basin mixer tap from Burlington. Image shown is for illustration purpose only. Brass made chrome Claremont Basin Taps. Image shown is for illustration purpose only. 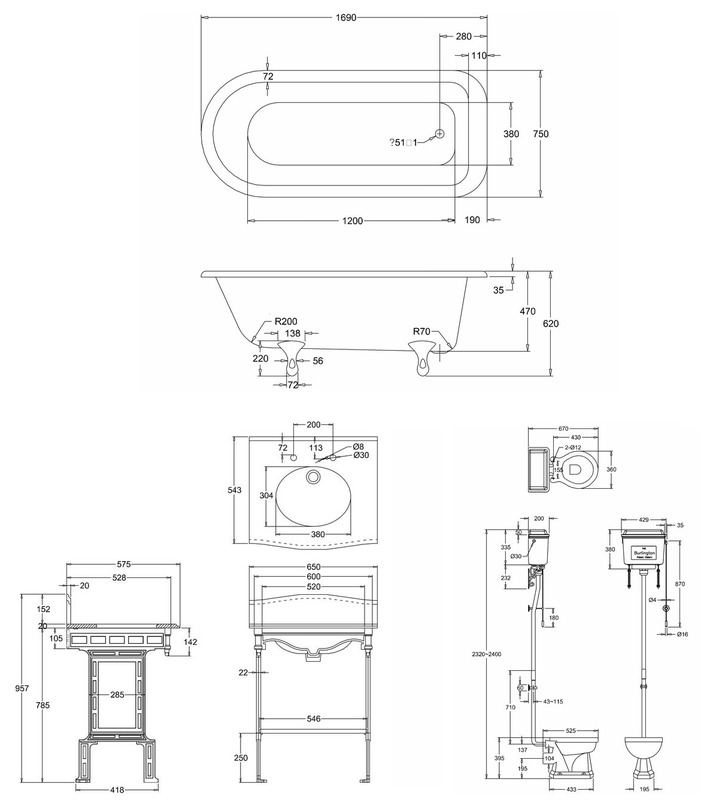 Beautifully crafted 3 tap hole basin mixer tap for perfect hot and cold water operation. Image shown is for illustration purpose only. Bottle trap designed by Hudson Reed comes in Chrome finish. Please Note : Image shown is for illustration purpose only. Burlington lights are supplied with G9 light bulb and chrome blanking washer. Edwardian eliptical light comes with pull cord.